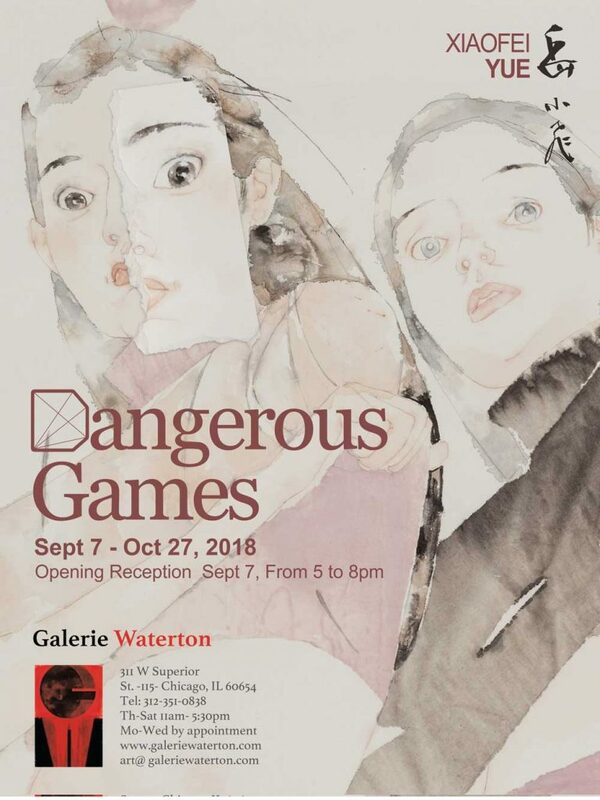 This September, Galerie Waterton in Chicago opens Dangerous Games, a new exhibition of work on paper by Beijing-based artist, and Chelsea alumna (MA Fine Art, 2012), Xiaofei Yue. 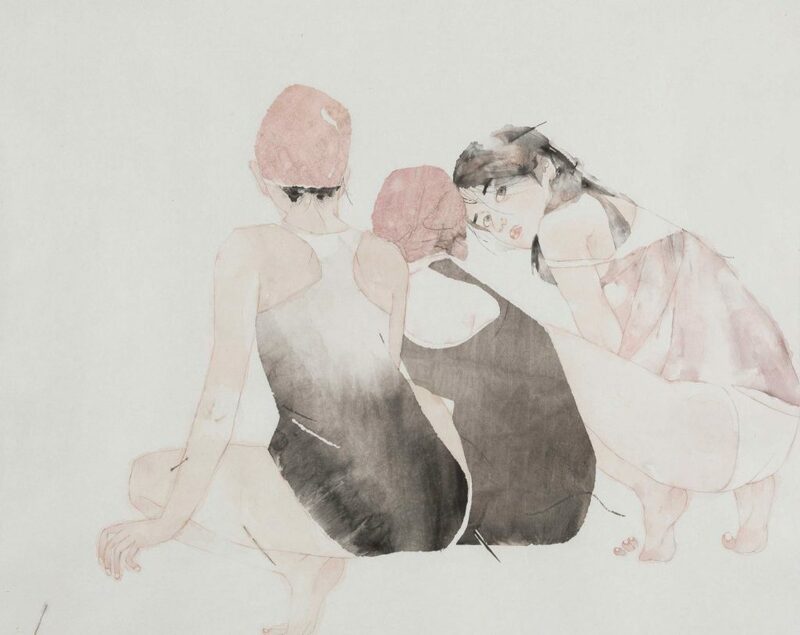 In her paintings on rice paper, Xiaofei speaks of the fragility and strength of relationships between women, implying that such relationships are in a dangerous and turbulent state. Her work gives a dynamic and unstable atmosphere to emphasize this fragility. We speak to Xiaofei about the exhibition and what has influenced her work. What bought you to Chelsea to study an MA in Fine Art? 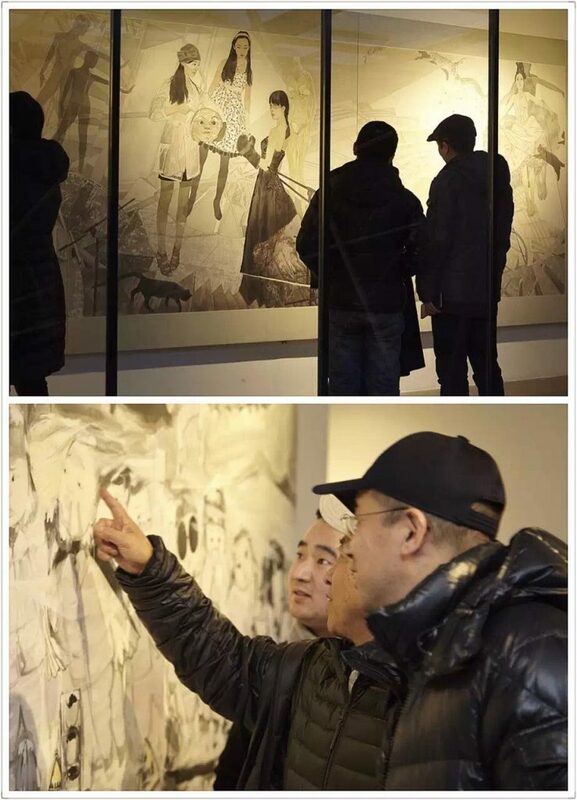 I was studying an MA in mural painting at China Central Academy of Fine Arts in Beijing in 2011, and while being exposed to Western contemporary art during my studies, I gradually developed a strong interest in it. At the time the information on Western contemporary art I could researched was limited, therefore I made up my mind to suspend my MA studies in Beijing and embarked on my one year in Chelsea. What was the best thing about studying in London? The best thing was the people I encountered. I was blown away by the cultural diversity in London. People are so different, and it helped me to seek my own identity. Ironically, my initial plan was to study Western art, but I end up with Chinese brushes, ink and rice paper and other very traditional Chinese material, which I found suited my art the best. London experience led me to have a clearer mind about my art, and it was formed as the result of comparing different cultures. What have you been doing since graduating? After returning to Beijing, I began to teach in Beijing Institute of Fashion Technology. At the University, I was given enough free time to continue my painting. Three years ago, I began working on a project scrutinising the relationship between two girls. My personal language was developed to create collision between Chinese watercolour and rice paper. Meanwhile I took part in a few artist residencies such as at School of Visual Art in New York, Slade School of Fine Art and Camden Art Centre in London. 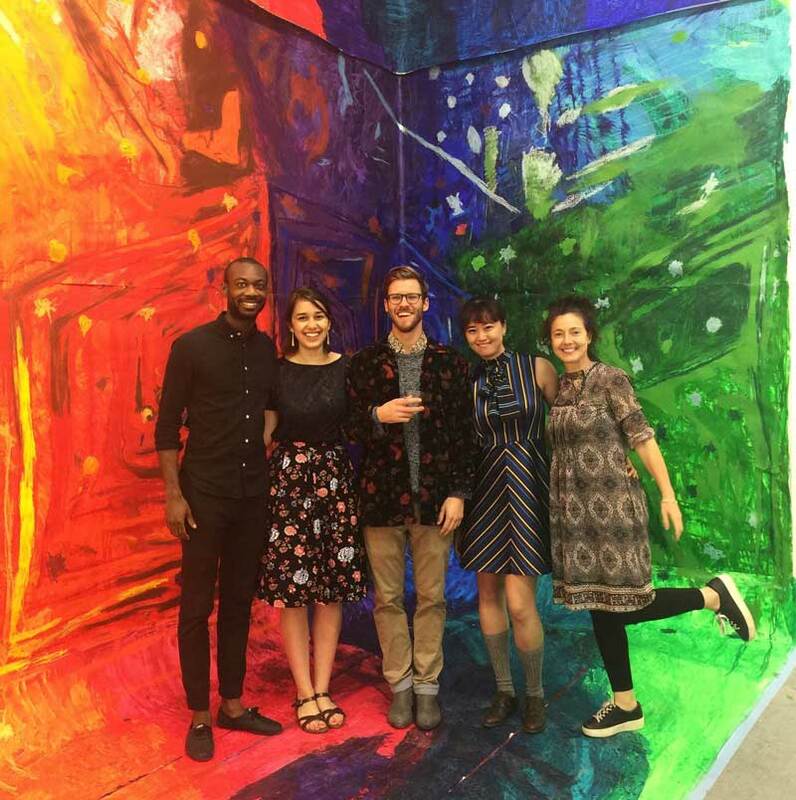 How did you end up having a solo exhibition all the way in Chicago? I should take the chance to thank my Singaporean artist friend Ashley Yeo who was also my classmate from Chelsea. The Chicago Gallery Galerie Waterton which was operated in Singapore came to Ashley first and offered a solo exhibition for her whereas Ashley generously recommended my work, and we had a duo exhibition in the end. 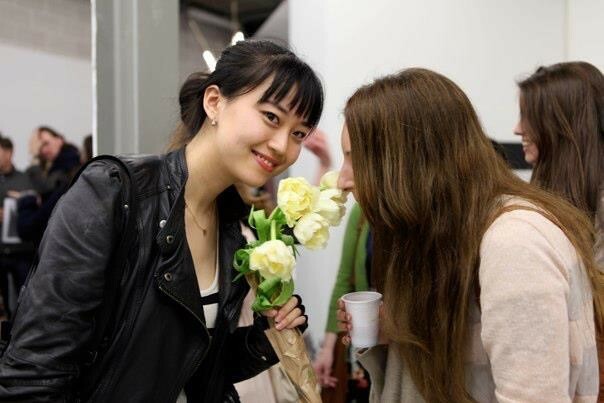 The duo exhibition came up roses and our work sold well. It was after this we began to discuss the possibility of a solo show which is now happening! I feel extremely gratitude that my fellow UAL graduates keep helping each other since graduation. For example, my other Korean classmates Jihee Hwang and So Young Moon helped me organise a solo exhibition in Korea in 2017. And recently I also applied for a group exhibition for my classmates in 798 Art District in Beijing. What inspired your series of work that can currently be seen in Galerie Waterton? The series of work speaks of the fragility and strength of relationships between women. They were inspired by the poem The Third Thing by D.H. Lawrence. As it says “water is H2O, hydrogen two parts, oxygen one, but there is also a third thing, that makes it water and nobody knows what it is…… ”, the third thing presents, two people encounter, click, and form connection. The intention of the series of work is to capture such a chemical moment by paintbrush. Who has been a big influence on your art work? Marlene Dumas. Her powerful work shows painting is not dying and she paints better than anyone. Why did you decide to focus much of your work on ink, watercolour and rice paper? Water-based material intrigues me, and I love to invite water to participate the process of painting, because water is flowing and it brings fluidity and contingency to the picture, and the characteristics of rice paper enhances such contingency. 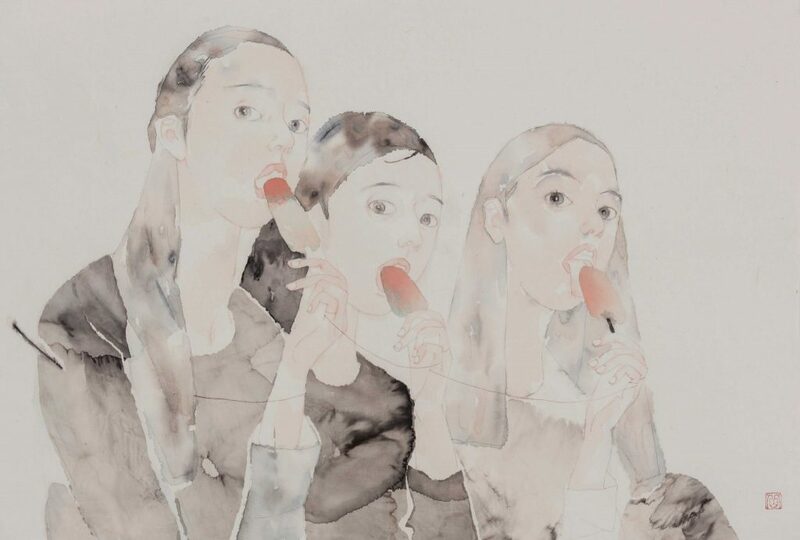 The accidental result they provoke through the materiality properly represents the ephemerality and fragility of the relationship between two girls. I’m proud that I’m still painting and survive. It is the best thing in the world that I can make a living by doing things that I am tremendously passionate about. I am in discussion on having a solo exhibition in Nanjing next spring. Painting is a life-long passion, and I will just keep doing it.